Most mature retail websites have lots of traffic entering through the product detail pages (PDPs). With good SEO and active shopping campaigns, many sites have more sessions beginning on the PDP than on the homepage. Consider that for one second - we tend to consider the homepage as the page upon which we need to introduce our brand. It is on the homepage where we set out our USPs and attempt to explain ourselves. But in reality, many more people arrive on your PDPs and listing pages (PLPs) than on the homepage. What’s more you will see that the deeper into the site someone lands, the more likely they are to bounce - that is leave after viewing only a single page. Homepages usually have a bounce rate of 10-20%, listing pages are a little higher but for product pages bounce rates are often in excess of 50%. This is understandable to a degree. Homepage and landing/listing pages are gateway pages: they are there to get you somewhere else - they are designed to move you along. The product page is the end of the road. That said, if retailers could bring that bounce rate down, then there is undoubtedly potential business to be recovered. 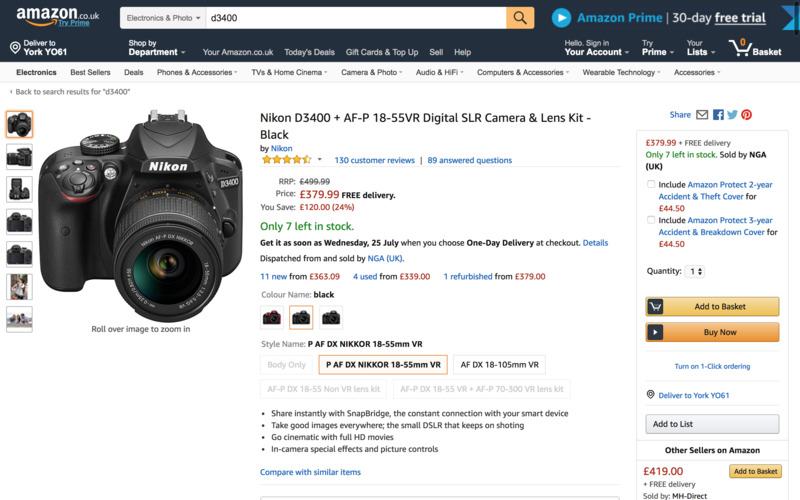 Amazon have been using a technique for years which I believe is designed to address this issue. This is something that other retailers could adopt. Note the addition of related products below the header. 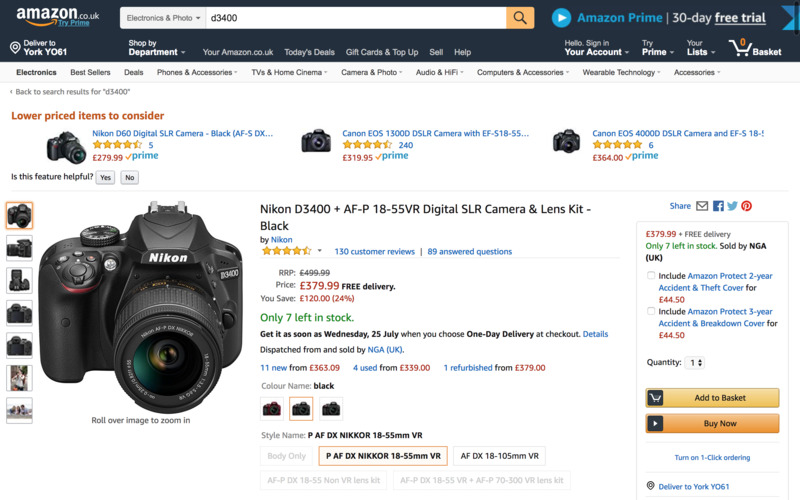 Amazon are showing recommended products not only above the ‘fold', but above the main product. The main product is still clearly visible, as are the key action buttons. 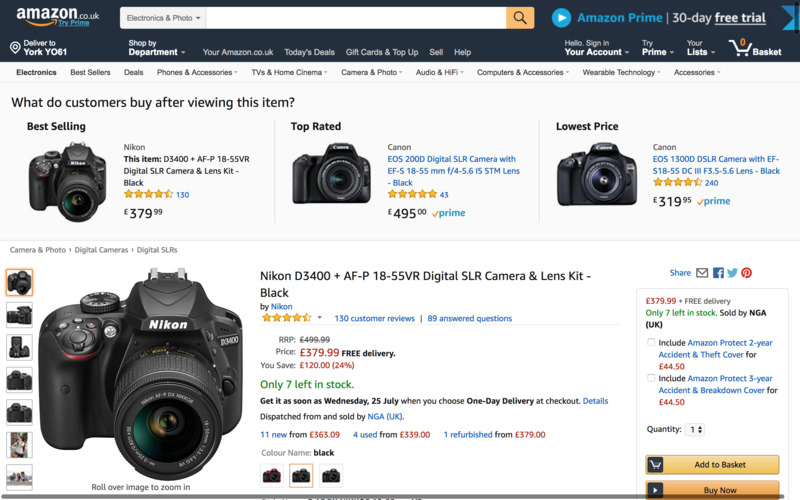 The page becomes more of a gateway page and presumably - Amazon have been using this technique for years - it has a positive effect. On the one hand it seems counter-intuitive - I have never seen a brief for a PDP that required related products to be shown at the top of the page. On the other hand, it makes a lot of sense, as it addresses many of the concerns outlined above. As someone who has watched countless session recordings and usability tests of PDPs, I know it’s not just a case of users bouncing, but of them also not even scrolling down the page. Moving recommended products up the page seems sensible in this respect. Note the nature of the recommendations too - not just a list of products, but ‘top rated’ and ‘lowest priced’ alternatives are shown, giving the user a range of price points to choose from. So they are showing related products on PDPs that you browse to. Again, this is designed to turn the PDP into more of a gateway page than a dead end. What’s more they are collecting feedback with the ‘Is this feature helpful?’ buttons. There are reasons why Amazon can do this. They have the tech, the data and the product range to make effective recommendations. However, many retailers use similar technologies - either using the platform’s built-in technology (such as Salesforce’s Einstein) or a third party solution such as Nosto. It would be relatively straightforward to deploy these recommendations in a similar fashion. This could be run as an A/B test: testing recommendations vs no recommendations, but also different rulesets within the recommendations to see if an improvement could be wrought. Recommendations could be set to show only when the user lands on the page (achieve this in your testing or tag management tool by displaying them only if the referring domain does not match the store’s).